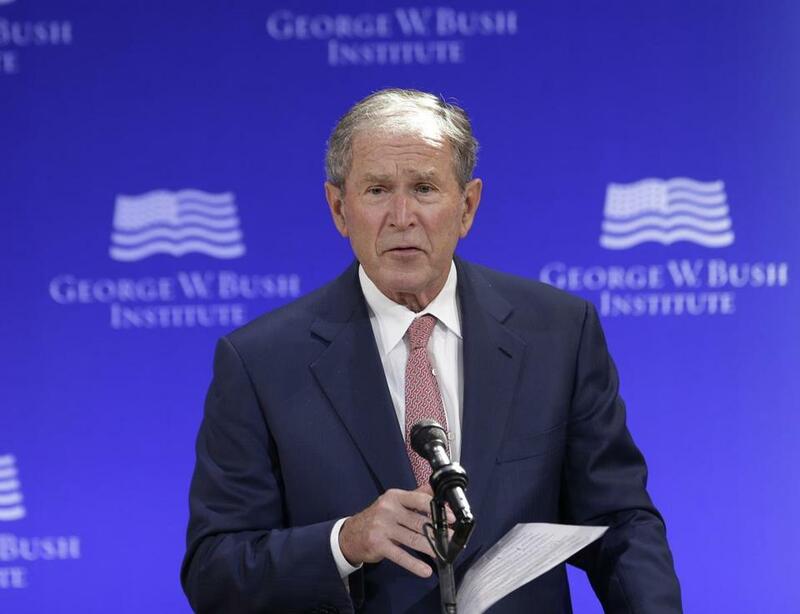 George W. Bush speaks at a forum in New York on Oct. 19. The list of transgressions committed by Donald Trump over the past nine months is nothing if not voluminous. But last week there came word of one that is like a gut punch for those of us who lived through the first decade of the century — he’s made people miss George W. Bush. According to a recent Economist/YouGov Poll, 53 percent of Americans have a positive view of the 43rd president. This reflects a larger trend in Bush’s favorability numbers, which, according to a June Gallup poll, stood at 59 percent. But the truly shocking part of this most recent poll is that W’s favorability among Democrats is at 51 percent — a far cry from the 10 percent of Democrats who felt so positively about the former president in March 2009. Look, I get it. Compared to the current occupant of the White House, W doesn’t look so bad. Bush supported immigration reform, and he didn’t spend much time during his presidency scapegoating Muslims, playing the race card, or cozying up to white supremacists. His painting hobby softens up his image a bit and he gave that nice speech recently where he kind of, sort of, took Trump to task. You put all that together, and perhaps we should reassess his presidency. 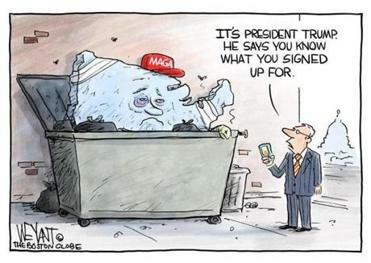 Don’t fall for it. I don’t care how bad Trump is as president. I don’t care that he’s well on his way to being the most incompetent, corrupt, and unstable president in US history; George W. Bush was a terrible president. Period. Let’s just do a brief rundown on W’s bill of iniquities. Has the president honored his America First agenda? • Started the Iraq War, which killed nearly 4,500 US soldiers, took the lives of several hundred thousand Iraqis, had a price tag, in excess, of $3 trillion in direct and indirect costs, and plunged the Middle East into turmoil, helping spark the rise of ISIS. • Presided over the worst financial crisis since the Great Depression and the meltdown of the global economy. • Passed massive tax cuts that disproportionately benefited the wealthiest Americans and did little to spur the economy. • His job creation record was dismal and median incomes fell by 4 percent during his presidency, a never before achieved feat in modern US history. • Those without health insurance grew by more than 20 percent; the poverty rate jumped by 26 percent, and W took a small budget surplus and turned it into a massive trillion-dollar deficit. • On foreign policy, Bush alienated key allies, did nothing to prevent North Korea from getting a nuclear weapon, and caused the United States to step back on dealing with global climate change. • He utilized torture, conducted warrantless wiretapping of American citizens, and oversaw the indefinite detention of suspected terrorists. Oh, and the worst terrorist attack in US history happened on his watch. Bush’s record of failure — across so many policy areas — is unmatched in US presidential history. Even Richard Nixon, the only president ever to be forced from office, could count a number of policy successes. For W, the cupboard is bare. Indeed, Trump will have his work cut out for him if he wants to leave the country in as great a shambles as Bush did. W’s presidency also offered a preview of the current dumpster fire at 1600 Pennsylvania Avenue. Like Trump, Bush staffed his administration with hacks, incompetents, and ideologues. Lobbyists were practically given oversight of environmental and business regulation with predictably awful results. Like Trump’s band of mediocrities, the Bush administration was dismissive of science, facts, and truth-telling, and also like Trump, Bush’s White House openly sought to politicize the Justice Department. He proposed a constitutional amendment in 2004 that would have prevented gay Americans from getting married and used that issue to mobilize religious voters in key swing states like Ohio. And in his reelection that same year, he engaged in divisive political rhetoric that portrayed Democrats and those opposed to his counter-terrorism policies as somehow unpatriotic. His presidency more than laid the groundwork for the angry, fractured politics and ideologically driven policy decisions that we are seeing today. And of course, Bush — like so many other prominent Republicans — largely remained silent as Trump took over the Republican Party. Our political moment might seem bad (and believe me, it is), but it shouldn’t cause any American to look back at the Bush years with fondness. W was a disaster, and America is still paying the price.